William Clark Green is the latest in the long series of singer/songwriters who have cut their teeth on the dusty plains of west Texas before taking a bite of Texas at large. The momentum behind Green’s career has been building steadily the past couple years before reaching a fever pitch of buzz here in 2013. Rose Queen, Green’s third release, is arguably the most anticipated release of the first half of this year in Texas Music, which says quite a bit due to strong releases forthcoming from scene headliners. 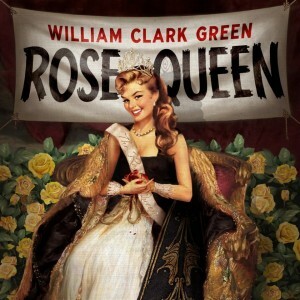 Rose Queen is a stylistic triumph that builds on the strengths of Green’s past album Misunderstood. Producer Rachel Loy has managed to smooth out Green’s rough edges without losing any of his intensity and authenticity. The title track kicks the record off with a statement that grabs your ears and informs you that you’re in for something unique. Green has taken the heady lyrical approaches of a Chris Knight and partnered it with an Americana rock punch reminiscent of Reckless Kelly throughout the album. “Remedy” juxtaposes a breezy melody on top of lovelorn lyrics replete with references to being strung out. The romp of “Dead or In Jail” brings to mind KMAG YOYO era Hayes Carll. Rapid fire lyrics of a bad trip in more than one sense staccato over a driving rhythm. “She Likes The Beatles” is perhaps the album’s most significant track as it distills the style Green has polished into its most basic elements. Co-written with Brian Keane, it’s an angst ridden tale of opposites attracting to the point of frustrated appreciation. This album is a jump in quality that sees William Clark Green raising the bar for himself and all others claiming a stake in 2013 Texas Music. It is real, raw and accessible. A hard combination of emotion and senses to pull off and one Green does admirably. Whether he’s lived all the songs on this album or not, Green makes you believe he has and that’s the most important thing. Believablility and authenticity are often missing in modern music of all genres. That’s not the case here. This record is one you’ll be hearing a lot from for the foreseeable future. Listening to this reminded me of the first time I heard Turnpike Troubadours Diamonds and Gasoline and knew they were destined to reach that next touring and respect rung. Rose Queen has put Green squarely on the map and is a refreshing reassurance that the future of Texas Music is in solid hands. Pre-order Rose Queen from LoneStarMusic–Album releases/ships on April 30.